A couple of years ago, our local funeral director, Ashdown Funeral Services, suggested that they would like to support our carol service and give people an opportunity to remember their loved ones as Christmas draws near. It might seem on the surface an odd idea but I felt that it could be an opportunity for evangelisation and links with those in Blackfen who do not normally come to Church. Towards the end of the carol service, I receive a basket of memorial cards, say the De Profundis in English, and prayers for those who have died. We have done this for three years now and I think it has been a success. Previously we had about 80 or so parishioners for the carol service; now we have about 250 people, so the work that the choir put into the service is appreciated by more people. It has also succeeded in creating a link between the Church and the wider community: people are very appreciative of the welcome they receive and of the reception organised afterwards by the Union of Catholic Mothers. I have also had subsequent pastoral contacts with people who have become better disposed towards the Church as a result. The photo above shows the girls who have formed our annual children's choir for Christmas. Several of them form a little choir every Sunday at our 9am English Mass. They sing the Introit in English according to a simple psalm tone, support the singing of hymns at the offertory and communion, and usually sing something after Communion, such as one of the chants popular at Lourdes. 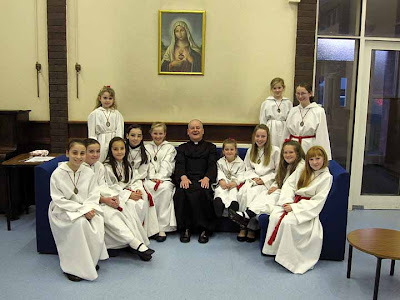 I am confident that as they get older, they will be more ambitious and perhaps sing some of the other parts of the Mass. They important thing is that they are not simply tied to a "four hymn sandwich" but are beginning to get a sense of liturgical music at the English Mass.